Researcher - Sarah Rogers Please Note: Whilst every care is taken in checking promoted links, we cannot accept responsibility for your use of third party web links. Having had much "success" researching the nursing career history of Mary Eliza Pinsent,(*) rather like success's in family history research, it can be easy to become complacent and expect to find out much about the name on a badge, either by only using a resource like 'Ancestry', or for researching birth and death certificates, wills, etcetera, which will increase the required expense. 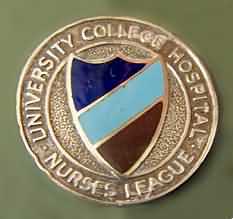 A recent acquisition is a case in point - a University College Hospital League of Nurses badge and supposedly corresponding G.N.C. badge issued to M. Sweeney in 1964. When the UCH badge was gently cleaned, revealed under the tarnish was its original owners name crudely scratched on the back, as if by her own hand, as being Ann E. Madoc-Brown (as seen and barely distinguishable in the photographs in Fig.1). 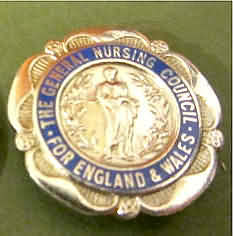 (Lt) General Nursing Council badge and (Rt) UCH Nurses League badge (sold as a pair). 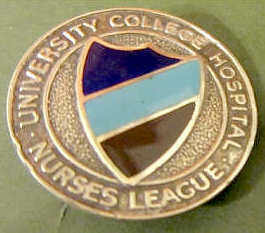 It appears that this was, in all probability, the UCH badge is that of Ann E. Madoc-Jones. Ann E Madoc-Jones, was born in Wales in the March of 1938. The only other information available on the internet for "free" (My 'Ancestry' membership lurches from 1 free membership via an upgrade at reduced prices of Family Tree Maker, saving much money - to the next, with the occasional hiatus when a disc doesn't arrive, or a summer break!) was a death registration. (This in itself is not surprising as often with nurses from an earlier era this is not uncommon, as nurses were not permitted to marry and continue working until around the end of WWII). Sadly however the death registration date was rather too early. Ann appears to have died in Oxfordshire, aged only 26, the registration being in the December 1964. Her badge gives no hallmark year being marked simply "silver", but it would appear that she trained at U.C.H. and joined the league upon qualification, obtaining her badge then, probably dying only about 5 years after becoming a registered nurse. "Maddoc-Jones. Ann Elspeth SRN no 277249 joined league 1960. Ann's UCH league badge came with another G.N.C. badge, sold as a pair. However, as Ann's revealed her name, it doesn't appear to be that they were a 'pair' - the G.N.C. badge being awarded to an M. Sweeney in 1964. (and with different G.N.C. SRN numbers to that of Ann Madoc-Jones). At present there is no information, after her death, to establish whether or not this person trained at UCH/worked there and was given Ann's badge during that period, or the badges were collected in some other way. It is possible that the two badges are not related in any way at all. Sadly this corroborated the research that I had done - which was a rather short and in some ways sad search into the life of a badge owner - that two pieces of apparent evidence turn out to be unrelated. Perhaps not that uncommon; I can remember young nurses dying during their training/ on the ward/early in their career - as with Mary Eliza Pinsent 's* sister Ada. but not what we would wish to find when researching into a nurses life and career. Fig 1/Fig 3. Copyright Sarah Rogers. 1. U.C.H. League of Nurses.